OMG pinch me! After living under some serious renovations for 2 months it looks like we are in the home stretch! Whew this hasn’t been easy…I’ve told you about it in my earlier posts; Tips For Planning a Home Renovation, Who Knew Choosing the Right Insulation Can Save Us Money and Insulation Makes the Difference – Can You Say Sound Barrier? Today’s update is a bit different, this is my very 1st article where I can share a FINISHED room with you all. 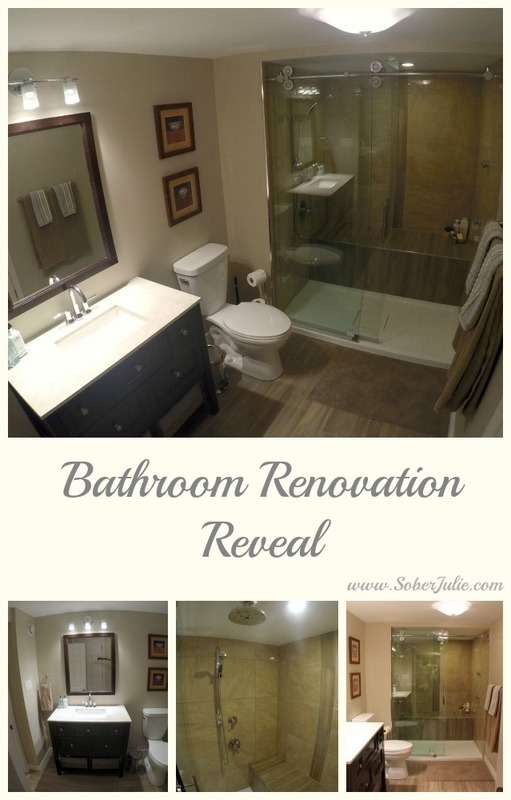 Yes it’s true, our bathroom renovation is ready to be revealed! Now, if you haven’t been around here much you may not quite understand the gravity of that statement. This is utter joy of magnificent proportions because we have had 6 people living in a house with 1 very old bathroom. I’m sure you can imagine how awful that has been…now onto the beauty which is our master bathroom. 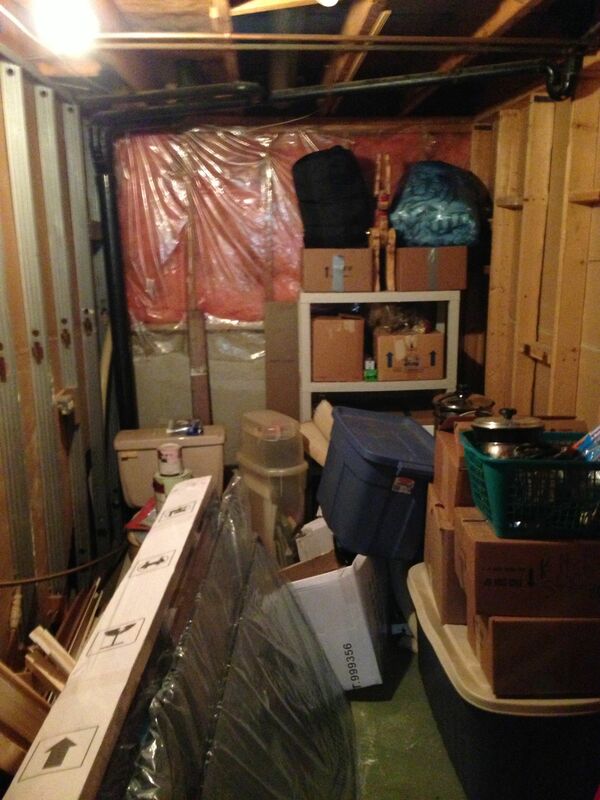 To begin with the space which has become the master bath was a junk closet…or more like a garbage pile. It had some plumbing roughed in but ultimately we began this project by calling in a plumber, jack-hammering the concrete and moving the plumbing. We also had an electrician come in because we needed a panel upgrade so we decided to go the safe, smart route and have him wire us up. We then levelled the concrete floor, threw up the studs and got to planning our oasis. Once we had the plan in place we headed out to purchase our supplies. As always we headed over to Home Depot to see what we could grab there. We actually purchased a good chunk of our supplies at Home Depot, from the wood-look ceramic tiles, vanity, lighting, fan, building supplies and the CIL Duo Paint Satin finish in Manuscript for the walls and trimmed in CIL Duo Paint Satin finish in Minimalist White. We specifically chose the CIL Duo paint because it’s the one we used on the main floor of our home and we know it truly is a one coat application. It’s a paint which doesn’t show off all imperfections, the colour is rich and it’s easy to work with. Listen, I’m someone who has chosen paints based solely on price in the past and lived to tell the tales about seeing my brush strokes on my finished walls. CIL doesn’t have a price point that breaks the bank and more importantly the finished product after one coat is great quality. 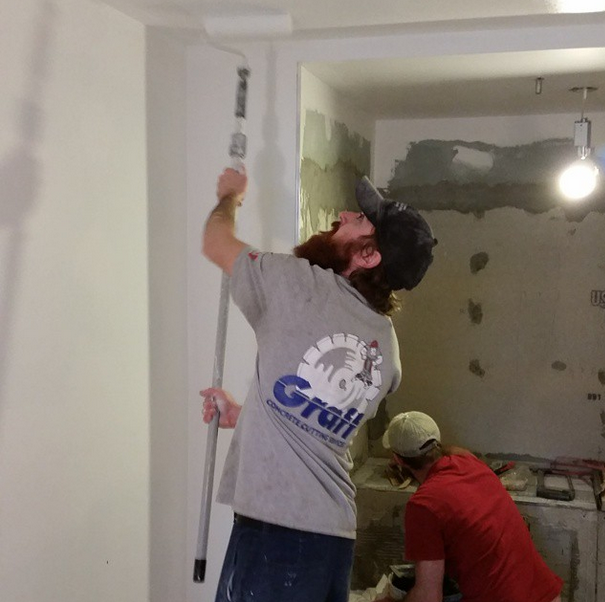 The boys set about painting the room as I happily made them coffee…the last job saw me painting 900 square feet so I was happy to give the reins up. In the photo below you can see the construction of the walk in shower happening while our buddy applies the ceiling coat. 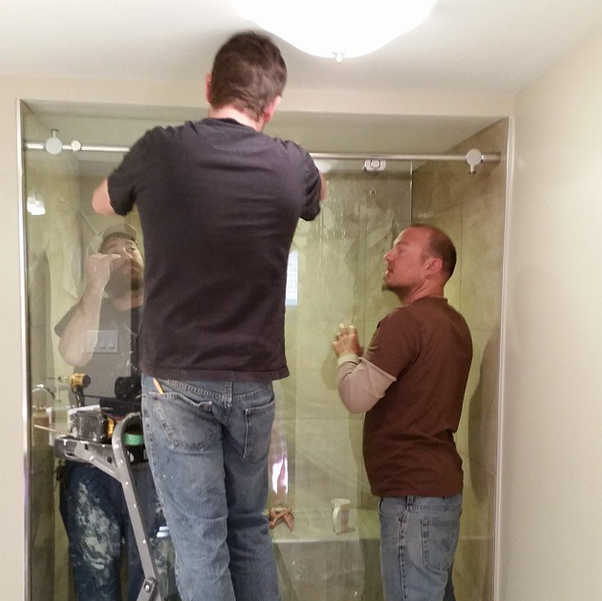 Here you can see the installation of our gorgeous walk in shower doors, this was a massive undertaking. The glass is very heavy and it can be finicky so grab your DIY loving friends and plan it out well. For the walk in shower we went with my dream shower system…I mean honestly who doesn’t think a hand held shower head, rain shower and body jets are bliss? How much do you love our shower bench? We carried the wood-look flooring onto the bench and up the wall to create a bit of a focus wall. We were after a fresh, clean look which wouldn’t close the space in…and in the end we are totally happy with our choices. 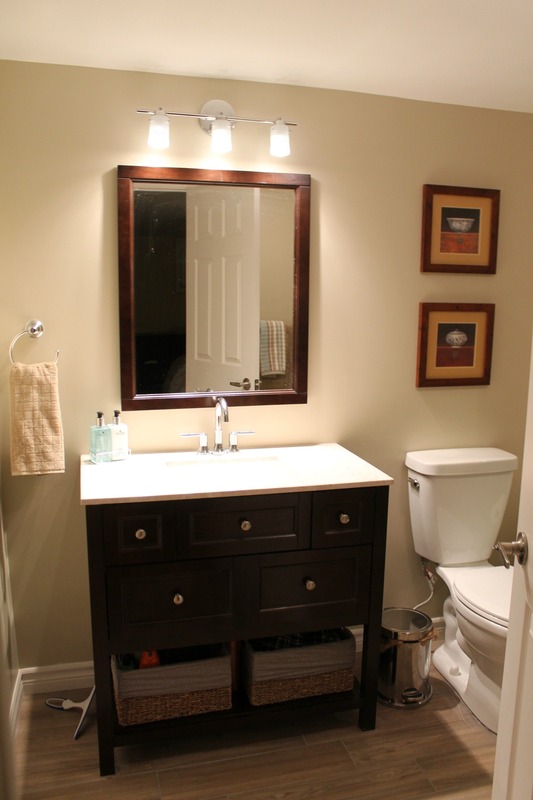 We found this vanity and mirror in the clearance area at Home Depot and it looks smashing! It has lots of storage with 2 small drawers, one large one and room for baskets on the shelf at the bottom. The room has really come together and we adore it…here are a few over all shots. Of course I’ve added a wee video to show off the space…. Disclosure: Thanks to my friends at CIL for providing me the paint for this project, all opinions are my own. Stunning bathroom! Love the bench in the shower! Awesome reno! I am so freakin jealous! I need and want a sit down shower so bad, it looks terrific! Looking great! 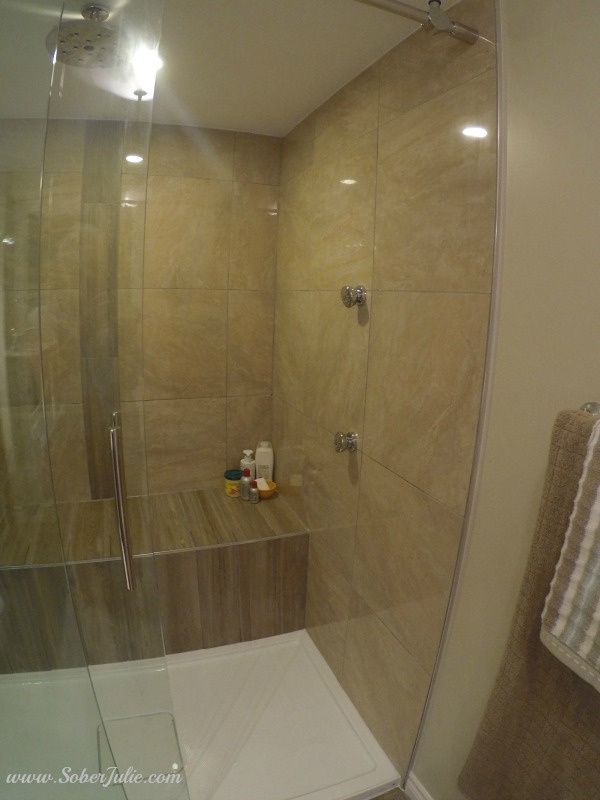 Renovating a bathroom is a bit difficult without wasting more space. Now a day’s wooden floor is going to be very famous as it gives classic look to our bathroom. I just love wooden floor it’s looking beautiful. Your bathroom renovation turned out so well. I have been looking into renovating our bathroom. Reading this has made me want to change the design I was looking at. Thank you for sharing. 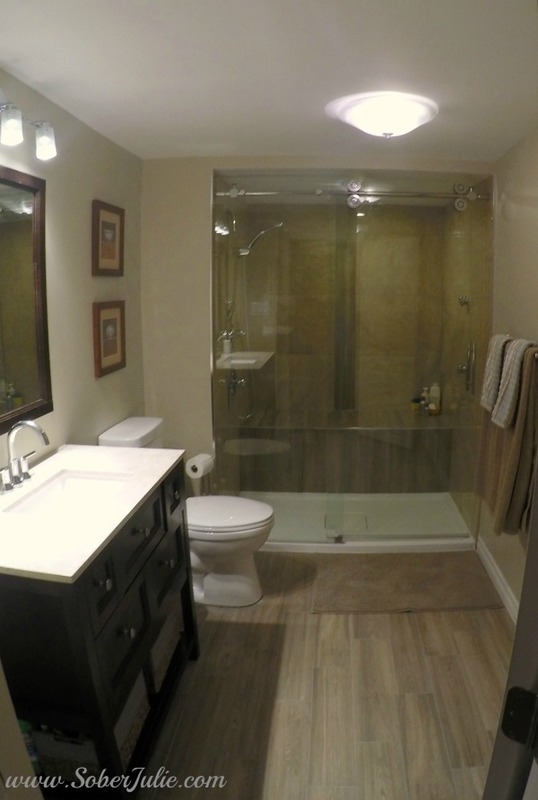 Wow, your newly renovated bathroom looks fantastic! That was really smart of you to hire an electrician to upgrade your box and wiring. If the wiring isn’t done right it can be a serious fire hazard. 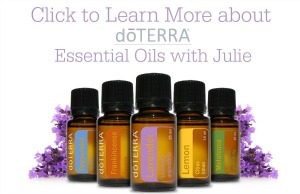 What a smart way to protect your investment. Julie, that renovation looks amazing! I really like the sink and cabinets. They compliment your floors very well. 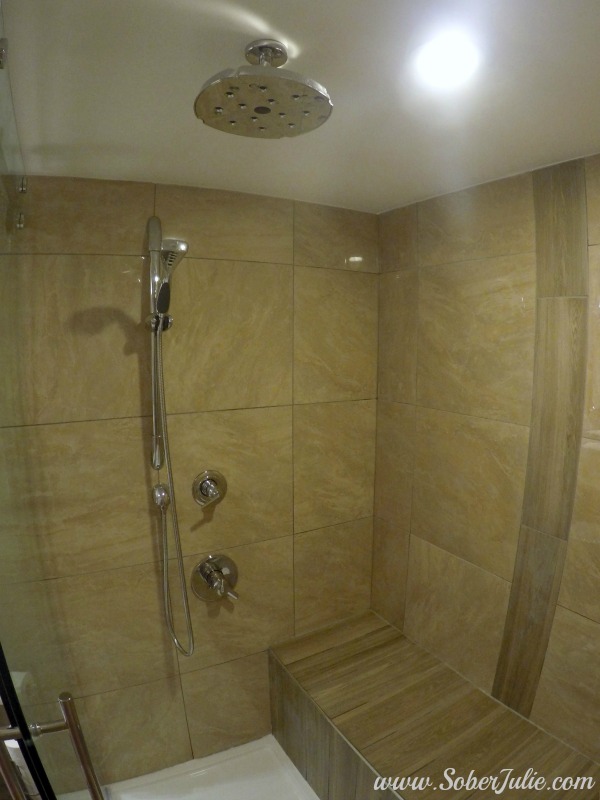 I love the shower you chose for this renovation! I actually really like the glass door look, and haven’t seen a door that slides on rollers like that before. I will have to show this to my husband because we might add this to our own reno plans! Thanks! 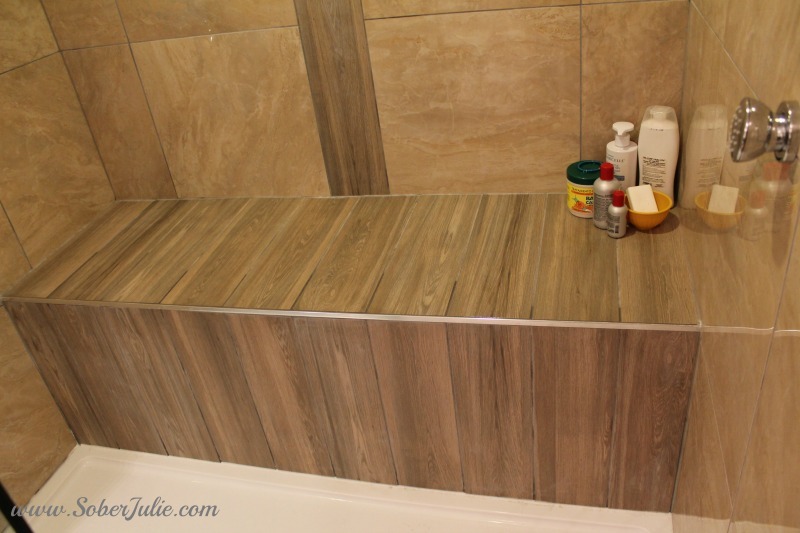 Hey Julie, I am a little bit jelly with your bathroom when I think of how mine looks like :) We are planning to do a complete reno and although I have come across lost of ideas, I really love how you have done yours. Thanks a lot for sharing this with us. That is one nice looking bathroom you have now! It’s a good thing that you got the plumbing out of the way early in the project so you could focus on the aesthetics. I am extremely jealous of your shower. The tiles, bench, and shower heads look absolutely amazing. Thanks for sharing! your bathroom look super luxury, and the most value added things which i like in there is your bathroom vanity, its really increase the overall luxury of your bath. 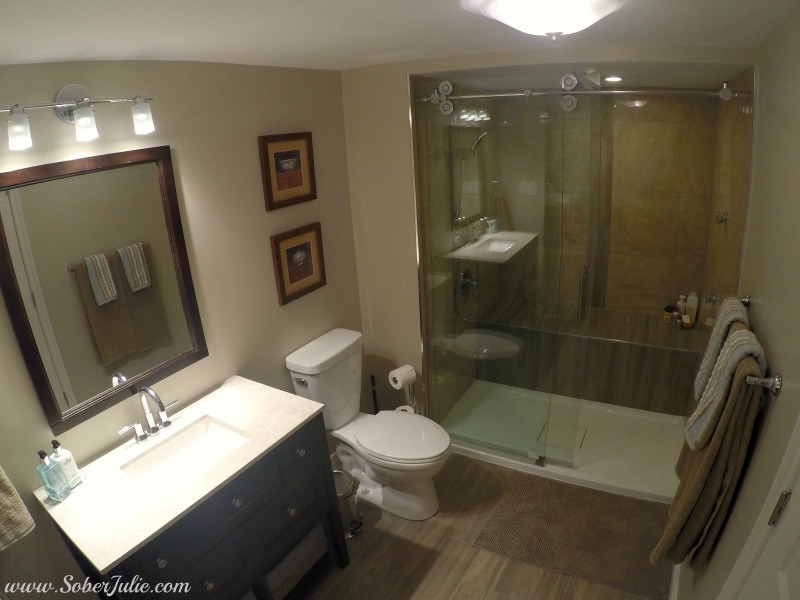 I cannot believe the transformation of your bathroom renovation! My basement bathroom is currently without drywall and being used as a storage area. I can’t wait to have get my renovation started. It’s good to know that a good chunk of your renovation materials were purchased at your local hardware store. I agree that it’s best to call in the professionals for all of the plumbing and electrical work. Thanks for sharing! It looks so beautiful, really a huge transformation. Do you like those shower heads? My daughter has one in hers and I find not enough pressure from them. Looks great! I love all the fixtures and tile you chose! Thanks for sharing. I love that you took a junk closet and turned it into a beautiful bathroom! My husband and I have a similar room that just kind of accumulates junk, and we’ve been discussing turning it into something more useful. Maybe we could renovate it and convert it into a guest bathroom so we have more than one.